Whether the scenes depicted in this print, and its companion print Short Flight, are real or the figment of someone’s imagination is shrouded in a cloud of mystery. 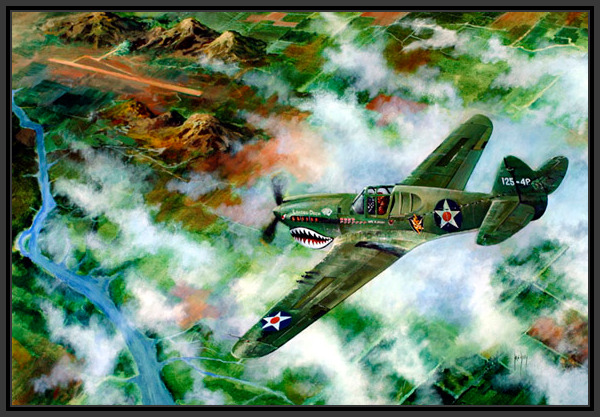 However the AVG was indeed disbanded on July 4, 1942 and was replaced by the 23rd Fighter Group under the command of Robert L. Scott, who later authored several books including “God Is My Co-Pilot.” The 23rd FG along with a few B-25s were all that General Chennault had in his fledgling China Air Task Force, (CATF). Another Close Call depicts a 23rd FG P-40 returning to Kweilin, China, after escorting B-24s making a strike on the Hankow railroad yards in September 1943. By that time the CATF had grown and had become the 14th AF under General Chennault. Of course there’s a story behind these two prints but you have to ask to find out what it is.